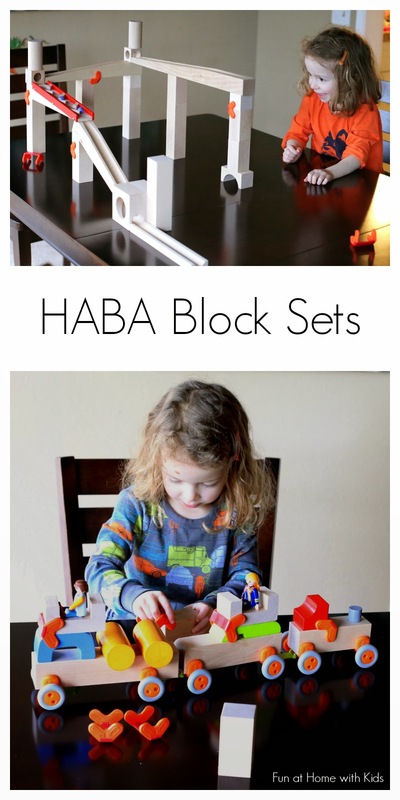 Disclaimer: At my request, HABA USA provided us with a complimentary set of Technic Blocks, Building Blocks, Marble Run, and Optics - the HABA Domino Set pictured is our own. I was not swayed by the free product; I honestly love their amazing toys so much! This post contains some affiliate links for your convenience. I have loved HABA toys since S was a baby. They make fantastic baby and toddler toys - some of our very favorites, in fact. So I was thrilled when I discovered that they also make amazing toys for older children as well. My parents got S a set of HABA Dominoes for her Christmas present this year and we immediately fell in love. After leafing through the booklet enclosed in her dominoes set, I realized that HABA's block sets are very unique - they all are compatible. How cool is that?! To give you a little peek into just how cool it is to be able to create a structure (or as S calls them "machines!") with so many varied parts, we photographed one set up we made as a family using pieces from each of the sets I'll be talking about today. If you want to see a video of the marble traveling through the marble run and setting off the dominoes, you can catch it here on our Facebook page. So let's get started with the simplest set - a set of basic wooden building blocks from HABA (available from HABA and from Amazon ). This is a great set for a baby or toddler. I honestly did not expect to feel that differently about these blocks than any of our other wooden blocks - but there is a big difference. The size and weight of these blocks was incredibly well thought out. They are the PERFECT size for little hands. Our little guy has some motor delays and these blocks were so much easier for him to grab and manipulate than our other smaller wooden blocks. They also have a really nice weight to them, so they don't knock over or slide off as easily as our other blocks. These would be a great gift for a baby on up. 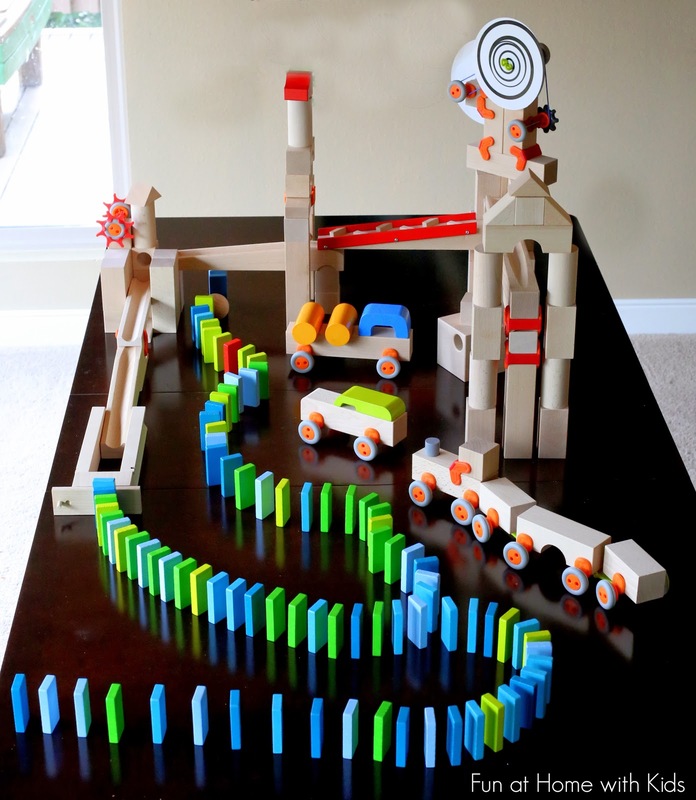 Next we have the HABA Big Looping Track Marble Run (available from HABA and from Amazon ). It is by far the coolest marble run we have ever tried. A year ago, S and I happened upon a Quadrilla Marble Run (also wooden). It was so frustrating for her to build with because it was lightweight and it would knock over constantly (in fact, I even struggled with that aspect of it!). We ended up reselling it after two weeks. I am happy to report that the HABA set has enough weight to it that we had literally zero problems with knocking it over accidentally. And for those cases where you are building a tall marble run, you can use the orange block braces to further stabilize the pieces. When we first got the marble set, the orange braces were a little tricky for S to get on herself, but after using them a few dozen times, they stretched out enough that she was able to get them without help (she's 4 and a half). If you were willing to assist with building, I'd say this would be a great gift for anyone 3 and up. 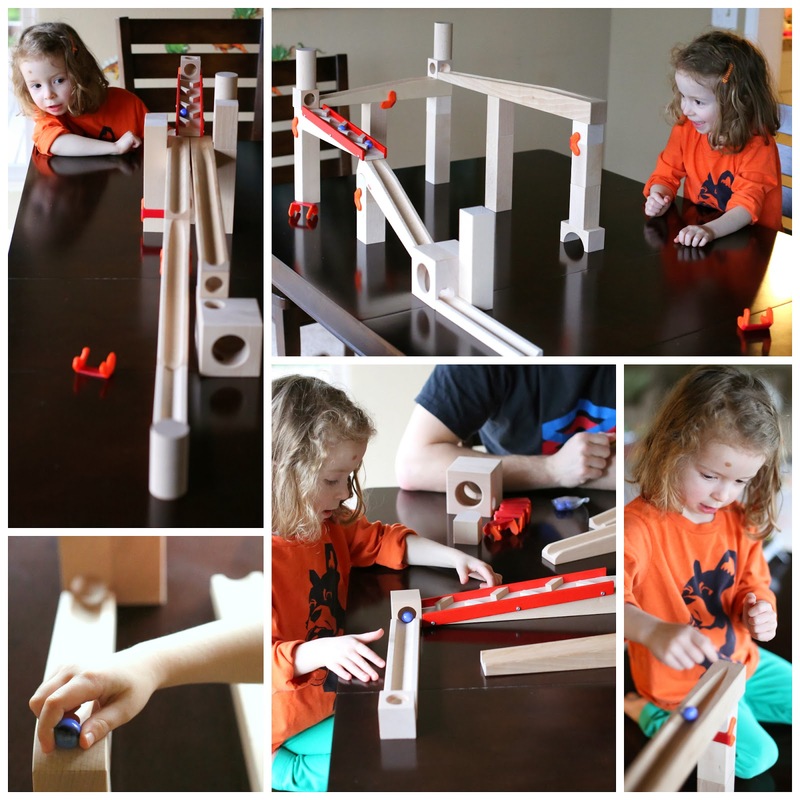 Somewhere around 4-6, children will likely have the skills they need to build more intricate marble runs solo. We helped S build some of these set ups, but three of them were her own inventions. My absolute favorite thing about this marble run is how fantastically it incorporates learning into play. It was amazing to watch her learning about slope, angle, momentum - all while tinkering with this toy. S adores the marble run and has already made a list of all the cool marble run add-ons HABA has for her wishlist. Though it was hard to pick a favorite from all these amazing toys - the Basic Set of Technics Wooden Blocks is it (available from HABA and from Amazon ). And in fact, it now has the honor of being my favorite toy EVER. It's really that perfect. Just like the Marble Run, science learning is so seamlessly incorporated into play. I was fascinated by how well S was able to problem solve and get her vehicles and trains moving if they weren't. She has learned so much about balance, weight, speed, aerodynamics and more - all by happily playing. This set has chokable parts, so it's again best for someone older than 3, though I will admit that X has a huge crush on the cars and is allowed to play with them under supervision. S created most of the vehicles you see here - she was able to use the green connectors as both trains and moving propellers. 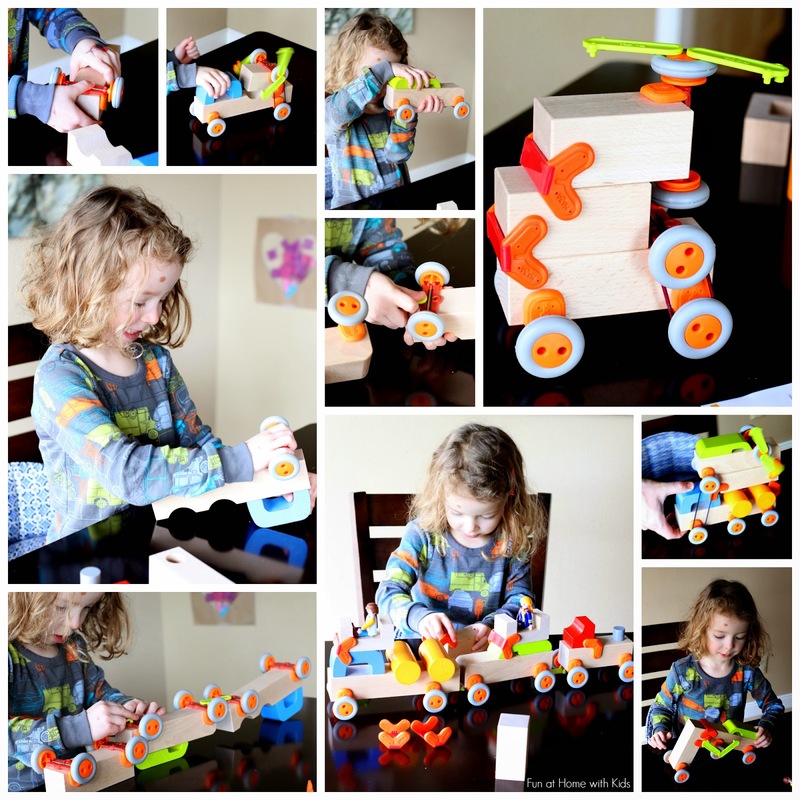 There are an enormous number of combinations you can come up with - trains, cars, airplanes, dump trucks - if it's some sort of moving vehicle, you can probably build it with this set. The final set we got to play with is the HABA Optics set (available from HABA and from Amazon ). Not only do they have premade animation strips and optical illusion cards, but they also provide laminated blanks so you can make your own with a dry erase pen (pen not included). We also discovered that we could make our own optics wheels with watercolors and watercolor paper! Because some of the concepts here are a bit advanced (like drawing step by step pictures to make an animation strip), I think this set is most ideal for older children (6 and up), but S still learned a lot about connecting the different gears and wheels, and enjoyed several other elements as well. S enjoyed watching the animation strips come to life, and she also loved staring at the black and white optical illusion cards as they spun. Most of the optics set-ups are moved by hand, but we made a few optic cars that spun the illusion wheels as they moved! 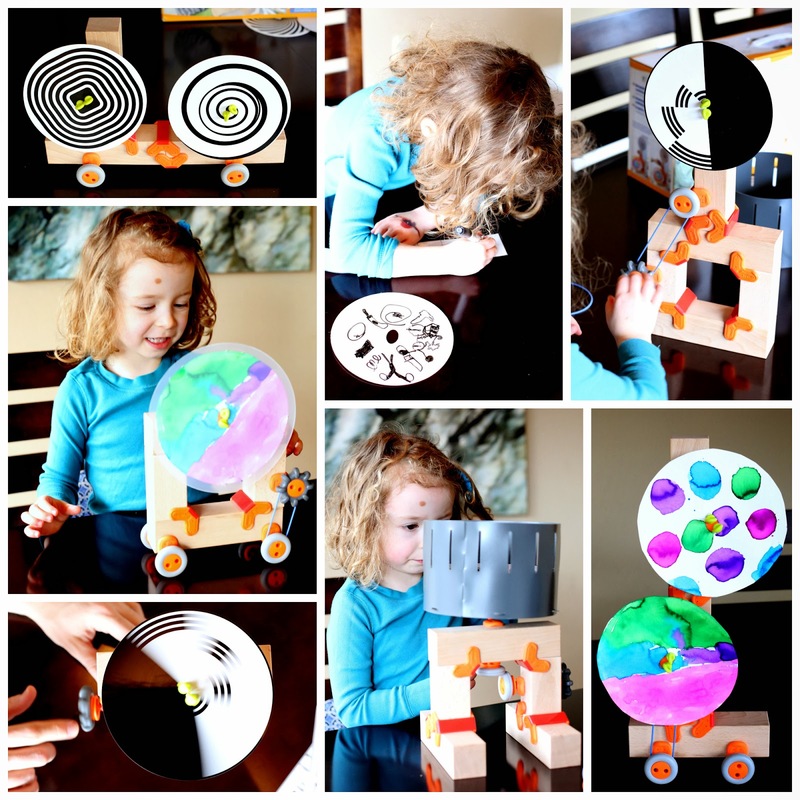 All in all this is a phenomenal set of toys to invest in - heirloom quality toys that are sustainably made and encourage open-ended scientific thinking are incredibly hard to find - but these are the epitome of just that. We cannot recommend them highly enough! I LOVE that you're offering an extra entry for those with financial hardship! Their blocks are expensive!! Thanks! I always offer an extra entry for financial hardship in my giveaways. :) And yes, but I think the price reflects the time and money (sustainable wood is not cheap) put into their toys. I love it too. Especially because families experiencing financial hardship have a significantly decreased ability to provide creative toys for their kids, with plastic branded characters and things being so cheap. Very, very awesome. What phenomenal reviews Asia!! We don't own any Haba toys yet, but I drool over all that I see. They look delightful, and I love that both S and X got so much out of playing with them! :) Thanks for the opportunity! Thank you, Blayne! I just know Kingston would love them!!! We love Haba! I hadn't seen the Technics set yet. I'd love to win but they are going on our wish list anyway! Thanks for sharing. Ooh! We haven't tried any of their games yet - thank you for the recommendation! And the marble run is SO awesome. You've got to check out the add-ons, too - the musical ones look amazing! Love Haba! Love how durable they are too. We have some we get to pull out for Super B from the boys (over 8 years old). Great Post! We would so love a marble run in our house - I love the creativity involved, the movement, the challenge to construct with purpose, the clean lines and quality of wooden products and the smile on a face when it all comes together! 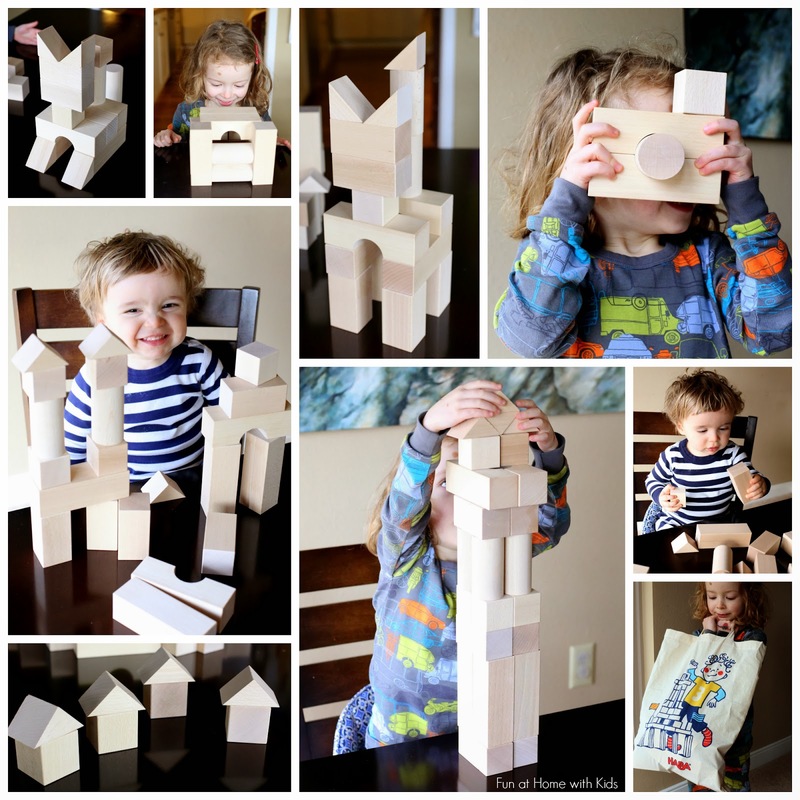 Wow you have me SOLD on the Technics Wooden Blocks -- unless I win lol -- my son would go CRAZY over them :) Thanks for sharing these toys in such fun, creative ways! Wow! This set of blocks is unlike any i've ever seen! It could definitely entertain the kids for hours at a time. Thanks for the great review! So giveaways are how I'm able to get my kids extra things until we can I can get back to work! We love these types of blocks, too! Oh my gosh, that sounds so so hard. I'm so sorry to hear. I am hoping extra hard that you are our winner! You could really use a turn of luck! Hang in there mama and I hope things get better really soon!! !